Today was Easter Sunday. We had a late "brunch" at my sister's house nearby, while it poured rain outside. I brought our parents, Pherne and Everett. When we arrived, my three nieces and their boyfriends were already there, as well as a couple of other friends. 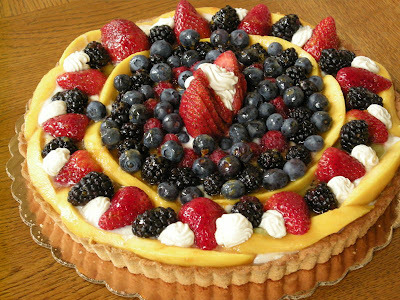 My sister had prepared a delicious vegan meal - and I brought the Fresh Fruit Tarts. This tart is as healthy as it is delicious and beautiful ! First of all, the star of this dessert is the fresh fruit: the better the fruit, the better the taste and nutrition. I don't mask the flavors of the fruit with sugar. Each berry is checked for ripeness - but no moldy berries! It's tricky with fresh berries as they have spores on them because they grow close to the ground. They have a short "shelf life", which you know if you buy fresh berries. I also make sure to use ripe mangoes and kiwi - I don't think anything tastes yuckier than unripe mango and kiwi - it really "spoils" the enjoyable experience of eating the tart. And with fabulous-tasting fruit -- how can you go wrong? You can't beat Mother Nature! The crust is made of organic whole-grain barley flour, sweetened with an apple, peach and pear syrup that has been custom-made for years for Alaine's Bakery. There is a LITTLE bit of fat (safflower oil) - nothing like a traditional pate brisee tart crust, which is loaded with butter (and made with dead white flour, and sugar). For the filling, I whip silken tofu with the same apple, peach and pear syrup, pure vanilla, and for our family, I added some Triple Sec (liqueur), which gives an orange flavor, as well as alcohol - very popular with the young adults of the family. The glaze is fruit-only apricot jam thinned with the fruit syrup. I remember attending a bakery-industry expo years ago, thinking I would find ingredients that I could use in my bakery. Instead, I had a real "eye-opening" experience in that I saw how different "standard" bakery ingredients are from anything I use or would consider using. I saw a demonstration of fruit tarts being glazed with a spray-gun! The "glaze" was made of chemicals, sugar...and the last ingredient was apricot "flavor". 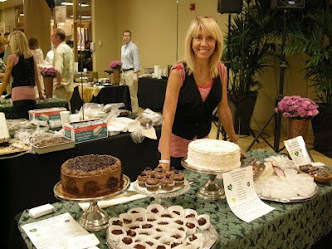 It was only one of many surprises for me that day, and it was the last bakery expo I attended. What is also so great about this tart is that you can eat it after a meal and it's not as "heavy" or as hard to digest as a "standard" bakery tart. Good thing I made two! THIS ITEM IS FOR LOCAL/ TUCSON, Arizona PICK-UP ONLY! NO SHIPPING AVAILABLE!! This blog is pure bliss! !